Photo Details: Crescent moon with the planets Venus (left) and Jupiter in near perfect alignment, Mashatu Game Reserve, Tuli Block, Botswana. Camera: Canon EOS 400D; Lens: Canon 70-300 F4-5.6 IS USM; Focal Length: 300mm; Shutter speed: 1/125; Aperture: f5.6; ISO: 400. Additional Info: The above picture was taken on Sunday, December 1st shortly before 7pm during a break while on a game drive in Mashatu Game Reserve. The brilliant night sky in Mashatu, as in other remote places, is a reminder of the light pollution that plagues urban areas. On this particular evening, we couldn't but notice the shiny sliver of new moon flanked by the two bright planets, Venus and Jupiter. At this stage there were no other heavenly bodies visible, making the intriguing line-up even more prominent. Evidently such an alignment of the crescent moon and the two planets (Venus and Jupiter) was a rarity and the next time something like this will occur is November, 2052. 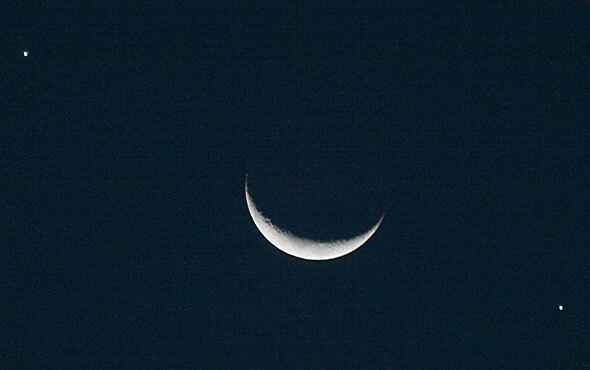 I used my Canon 70-300 F4-5.6 IS USM zoom lens at 300mm, resting the camera on a beanbag. I deliberately under-exposed the picture to make the sky darker and allow a faster shutter speed to minimize subject and camera movement. During a recent trip to Mashatu Game Reserve in Botswana's Tuli Block, our safari guide Isaac arranged a visit to National Geographic's Botswana webcam, WildCam Africa. The webcam is operated from a hide overlooking Pete's Pond, a man-made waterhole in Mashatu that acts as a magnet for thirsty animals and birds. The camera provides viewers with live video footage around the clock. During the day it's manually operated while at night it's set to pan automatically. On our arrival around 6.30am at the hide, we were welcomed by Afke, the regular camera operator, who is from Holland but has been working at Mashatu for more than a year. The camera itself is mounted on a tall pole above the hide and Afke is able to control this from a computer inside the hide (below). Afke uses a mouse to move the camera horizontally and vertically and can zoom right in for close-ups of subjects as small as insects. This, she explains, has allowed NG to keep the camera operating year-round. Initially the webcam was set up only during the very dry months when animal "traffic" was guaranteed, and then switched off in the wet seaon when animals have many alternative water sources. But with the ability to zoom in on birds, small reptiles and insects, there is enough to keep viewers fascinated even during the wet, summer months. Not only does Afke control the camera, but she's simultaneously communicating with viewers via the WildCam Africa Forum, answering questions and helping with wildlife identification, at which she's become an expert. I tried my hand briefly controlling the camera - using the mouse for tracking and the wheel for zooming - and quickly discovered it takes skill and practise. For a short time the dedicated "Pondies" around the world who watch the wildlife action must have been surprised by the wierd clips of sky, tree branches and water that appeared on their monitors as the camera swung around wildly under my inept control. Fortunately I was able to take normal wildlife pictures during our game drives in Mashatu and I'll be posting a few of these in coming days. 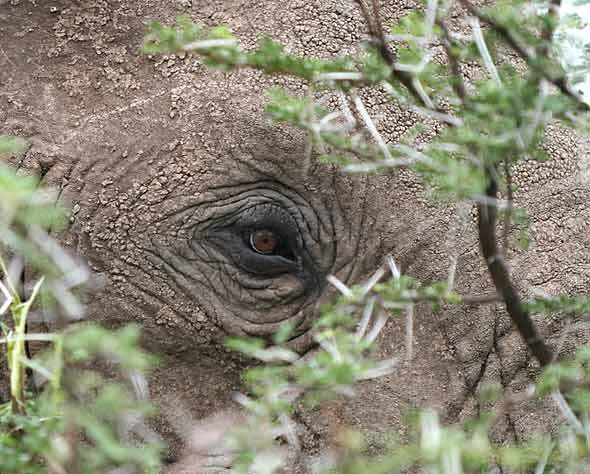 Photo Details: Elephant's head and eye are framed by the leaves and thorns of an acacia tree as it browses from the tree, Mashatu Game Reserve, Tuli Block, Botswana. Camera: Canon EOS 400D (Canon Rebel XS 10.1MP); Lens: Canon EOS 80-200 F2.8 zoom; Focal Length: 200mm; Shutter speed: 1/500; Aperture: f2.8; ISO: 200. 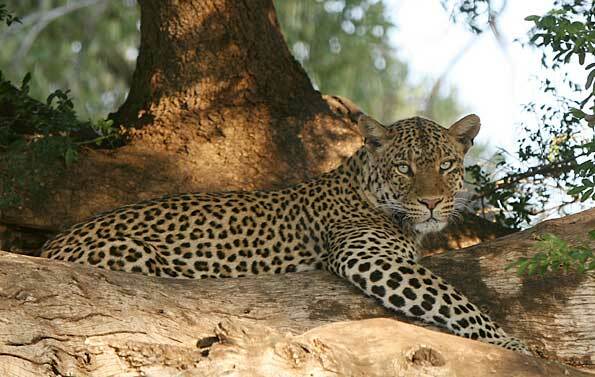 Photo Details: Leopard (Panthera pardus) relaxing on branch of huge mashatu tree, Mashatu Game Reserve, Tuli Block, Botswana. Camera: Canon EOS 400D (Canon Rebel XS 10.1MP); Lens: Canon EOS 80-200 F2.8 zoom; Focal Length: 200mm; Shutter speed: 1/200; Aperture: f5.6; ISO: 400. See our Leopard Prints and Posters for an outstanding selection of leopard photography and fine art.